This playful necklace is cast from reclaimed aircraft aluminum. Flight can be as fancy as a sleek, aluminum-skinned airplane, or as simple as a folded sheet of paper pushed on a pillow of air. 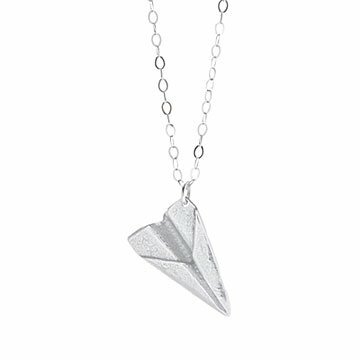 Inspired by the nostalgic form of a paper airplane, Jerry Moran made this necklace from salvaged scraps of aircraft aluminum recast into the form of the classic DIY toy. It features a satin finish and sterling silver chain for a playful but elevated design. The feather-light pendant makes a fitting gift to remind dreamers to keep their imaginations flying, encourage those who may feel they’ve lost their flight plan, and never forget the creative child within. Handmade in Colorado. My boyfriend ordered this for me last Christmas! I've worn it everyday since, and it is still in great condition. This is the third necklace I purchased from Uncommon goods that did not last. One, the gold wore off very quickly, this one broke, one bent.